Apple may have surprised the Mac community with its announcement of OS X 10.8 Mountain Lion on Thursday, but you’ll have to wait until this summer to upgrade. Until then, you can emulate one of Mountain Lion’s upcoming new features thanks to an application called AirParrot. AirParrot is a utility that mirrors your Mac’s display on an HDTV with Apple TV via Apple’s AirPlay technology. Since AirParrot works with Mac OS X 10.6 (Snow Leopard) and 10.7 (Lion), you can use it now—however, Apple’s AirPlay Mirroring will be built right in to Mountain Lion, and performs the same function. As reported by TUAW, the app works by encoding your display’s image as H.264 video, then transmitting that to an Apple TV on the same wireless network. It’s essentially a real-time screen capture, which is a clever way of mirroring the display, but it sacrifices image quality due to the data compression required. It will be interesting to see how AirPlay Mirroring compares in this regard. There are a few other caveats with the current version of AirParrot to be aware of. For one, it only supports video—no audio is broadcasted via AirPlay. However, AirParrot’s developers say this will be added in a future update. Also, DRM-wrapped videos from iTunes won’t play through AirParrot. To work around this, you have to display the video through the iTunes implementation of AirPlay instead. Although Apple is incorporating a similar feature in its newest operating system, this doesn’t render AirParrot obsolete. AirParrot still has a few advantages that make it worthwhile—compatibility with Snow Leopard and Lion, and support for a wider range of computers. Apple says that AirPlay Mirroring in Mountain Lion will require Macs with a second-generation Intel Core processor, while AirParrot simply recommends Nvidia or Intel HD graphics chipsets for optimal results. Plus, you can start using AirParrot today—there’s no need to wait for Mountain Lion. 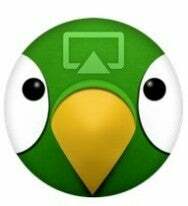 AirParrot is readily available and costs $10 for a single license or $30 for 5 licenses. It requires Mac OS X 10.6 or 10.7 and a second-generation Apple TV.